Sankari's Sunshine Corner: 7 Days of Love - Day 4: Missing You! Happy hump day! 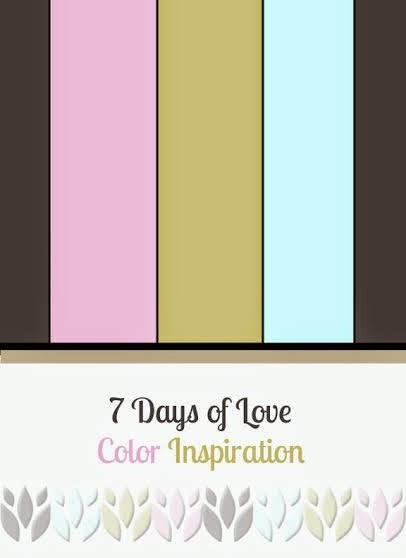 I am having just a blast doing the 7 Days of Love Challenge with my amazingly talented and uber awesome friend Jen Shults! Its been so much fun getting to make love cards as we countdown to Valentine's Day and to see what Jen has up on her blog each day! We both have also created sketches and color inspirations for this challenge that we gave each other :) and for today's Love card, I decided to use my Color Inspiration that is on the left here for my card today. For today's card I decided to make a love card for a really good friend of mine who lives far away - So I decided to make a missing you card by using the You Are Here stamp set and cutting out where I live using the Heart Stacklets and to this I attached the sentiment: "missing you" - kind of like sending her my love from where I am and telling her how much I miss her friendship! 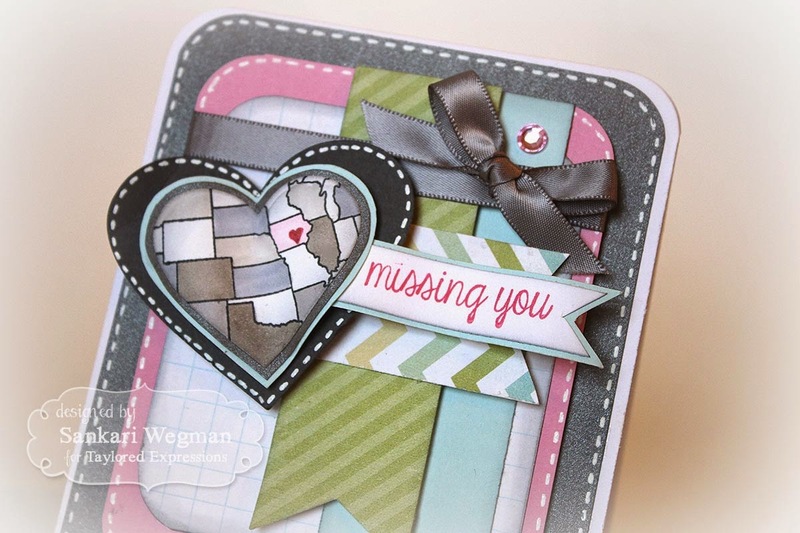 I stamped the image of the US and then cut out the midwest where I live with the Heart Stacklets and then created a layer of mats and added some white gel faux stitching around the edges. I had so much craft therapy making this card and can't wait to send this to my friend! 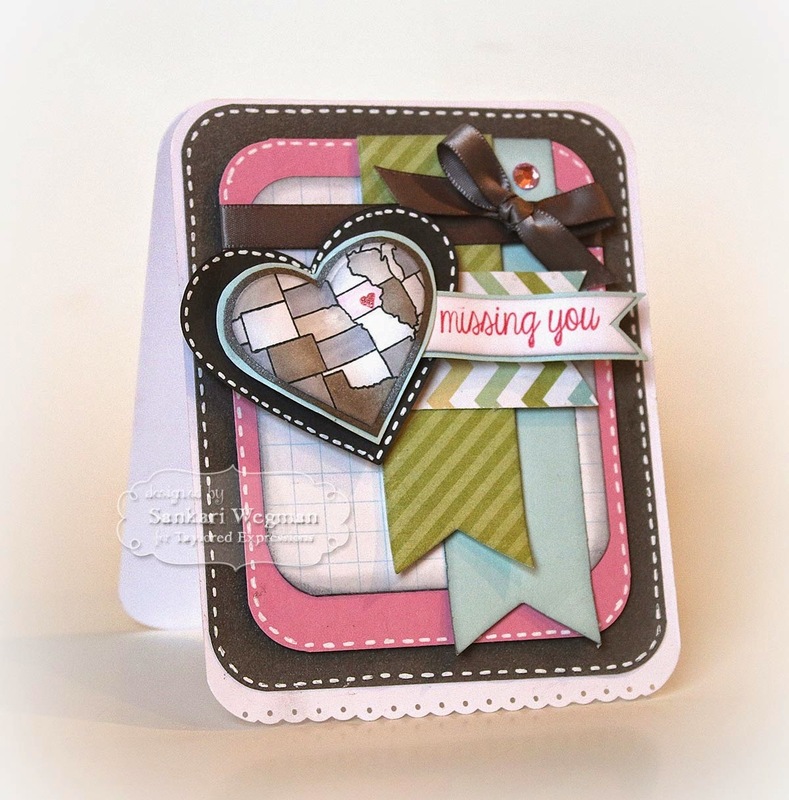 Please hop over to Jen's blog to see what pure amazingness she has created for today's Love card!! Thanks so much for stopping by today! Please hop over tomorrow for Day 5 of the the 7 Days of Love festivities!!! OMGoodness what a great idea to die cut out a portion of the map stamp - that's brilliant! This card is just all over brilliant - I love the bottom edge, the gorgeous stitching the perfect inking - seriously wowsa!